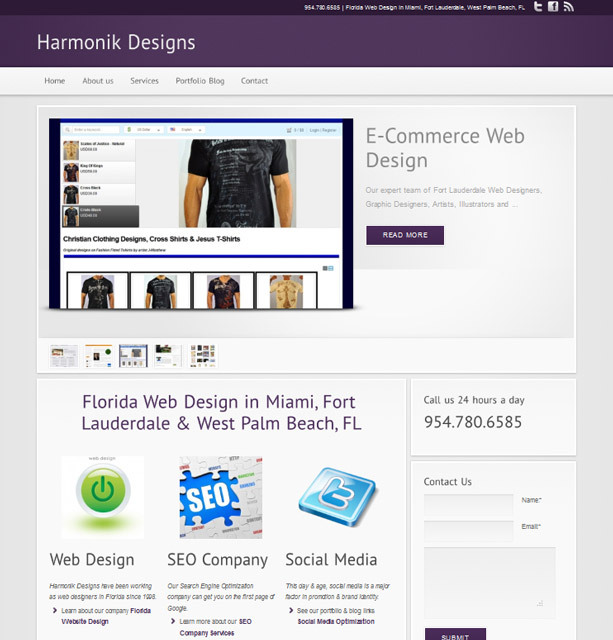 Our parent company, Harmonik Designs Inc. just got a fresh new face lift. Since most of our business has been Search Engine Optimization, SEO and Social Media Marketing for the last few years, we redesigned the website so it would focus less on print and graphic designs and more on our Florida web design company and Search Engine Marketing specialist work. We are very happy with the look and feel of this one. Purple was one of our original logo colors and this site is loaded with all the goodies. Custom sliders, blogs, rss feeds, twitter accounts, social icons, multiple phone number, address & contact locations, awesome contact forms and it looks pretty. You throw in the custom colored links in the footer, and we have a winner ladies in gentleman. I loved the old HTML site, but from it’s launch in 2003, it way overdue for and upgrade. Now it’s a monster of a site with a portfolio blog, tag clouds, sitemaps and all the latest features that we have come to expect from a web 2.0 website. But in the world of web 2.0, this web design is probably pushing about 2.5 and up. But seriously, check out the site and please leave us a comment, we would love your feed back and be happy to help with any possible projects as well. Don’t forget to subscribe to our MIAMI SEO COMPANY BLOG for more info on Graphic Design, Web Designers in Miami and Florida Search Engine Marketing.